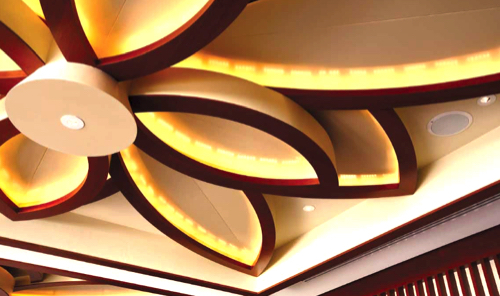 Behind the delicate details of the flowery decorative ceiling panels is a framework made of lightweight steel, designed to be durable, strong, and long lasting. This ceiling has a multi-layered look, created by overlapping layers of decorative lighting for an eye-catching visual effect. 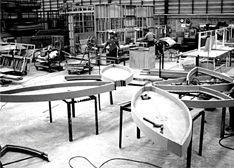 The production and assembly of the specialized moldings requires meticulous craftsmanship in the production of shop drawings, plus a careful planning execution in all stages of production. All timber and metal components are inspected to eliminate any imperfections before fabrication in order to ensure the highest quality and time efficiency. 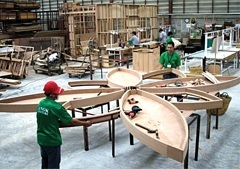 All production and finishing is completed before installation on site by our expert technicians. 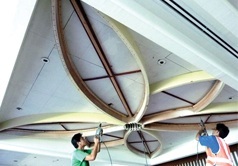 The beautiful flowery decorative ceiling is the result of a sophisticated design and complex production process. It embodies Kanok’s refined skills and special techniques. The design adds a sense of softness to the ceiling and is complemented by lighting effects.